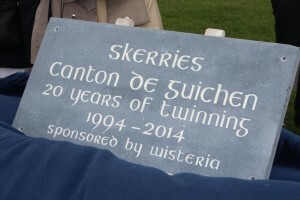 Skerries Town Twinning Association, part of the Skerries Community Association, looks back on a very successful visit from France which marks the 20th anniversary of the first visit from Guichen! Fond farewells, warm hugs and kisses on both cheeks were the order of the day on Tuesday afternoon last, when Skerries hosts bid ‘au revoir et bon retour’ to the 41 guests who had come to Skerries from the Canton of Guichen. 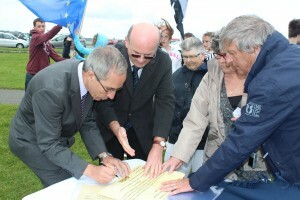 They were here to celebrate the twentieth anniversary of the twinning of the two areas. It seemed like no time since the visitors had arrived to blue skies, but, right on cue, the first rain of the five days fell, as they departed. During their stay, the visitors, young and old, had packed in an eventful time. On Friday morning, the adults of the group had guided tours of Ardgillan Gardens and the Castle, while the younger visitors were warmly welcomed to the Cúl Camp in Skerries Harps GAA. In the afternoon the adults among the group had guided walking tours of Skerries, and the kids had a Treasure Hunt around the town. Friday evening saw the official opening of the joint photographic venture, called ‘Through Each Other’s Eyes’ – photographers from Guichen and Skerries having photographed each other’s landscape and people. The opening was performed by Councillor Grainne McKenna, deputising for the Mayor of Fingal. There was a large crowd from across a broad spectrum of local people, many of whom had been among those who had welcomed the original visitors twenty years ago. Many of the photos were quickly sold, a tribute to the high quality of the works. 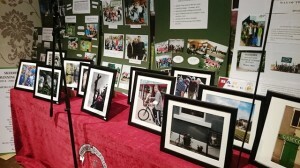 Others photos were on display in Seasons, Rockabill, Parachute and The Plough restaurants. 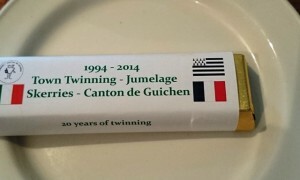 On Saturday, an illustrated talk on ‘Twenty Years of Twinning’ took place in Keane’s Bus Bar and Skerries Town Twinning Association was pleased to welcome representatives from Rush, Loughshinny, Balrothery and Lusk Twinning Associations who spoke of their experience of having a twin town. On behalf of the Canton of Guichen, Philippe Gourronc, Jean-Paul Gachot and Jean-Paul Quéré made contributions to the discussion which followed the talk. Meanwhile a drama workshop occupied the younger folk. Workshops on Celtic embroidery, set dancing and traditional music were also organised. An evening of music and song, by young Skerries artists took place in Café Jacques to round off a busy day. At Mass on Sunday, there were French, English and Irish readings, followed by a display of Breton music and dancing outside St. Patrick’s Church, before a colourful parade set out for Guichen Way ( on Red Island), where despite the strong breeze, a beautifully engraved piece of Milverton granite commemorating the twentieth anniversary was unveiled and the twinning promise of friendship and cooperation was renewed. This plaque was kindly organised and donated by Wisteria Garden, Strand Street. This plaque will be incorporated into the new Town Garden, beside the Library, when it is completed. On Sunday afternoon a hotly contested Boules tournament took place at The Dorn. 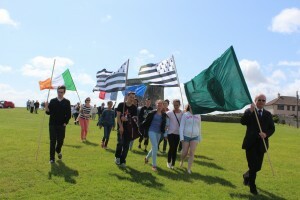 Eight teams were formed (each comprising French and Skerries participants). After several rounds of heats, the winners, aptly named ‘The Goats’, narrowly defeated ‘The Bears’ amid much fun and laughter and a fine air of competitiveness. A return match is promised in Guichen next year, when a group will travel for the twentieth celebrations there. A special Dinner was held on Sunday evening in Skerries Golf Club. Bright and early on Monday morning, the Guichen group, accompanied by three Skerries members set out for a day-long excursion to Kilkenny. It was an excellent day, the weather held up and there was an enjoyable guided tour of St. Canice’s Cathedral, with many of the group climbing the Round Tower, followed by a picnic and tour of Kilkenny Castle. A little retail therapy followed and all were glad to climb aboard the bus for the return trip to Skerries. A final evening of singing and music was held in Joe May’s and despite the weariness which was beginning to creep in, a very lively session took place, with Skerries and Guichen singers and musicians contributing in turn to the entertainment. Finally, for the brave-hearted, a quick trip to Dublin took place on Tuesday morning, before packing of bags for the return trip via Rosslare. This entry was posted in News, Town Twinning by SMcK. Bookmark the permalink.